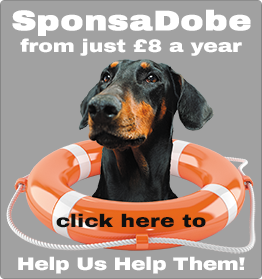 Home Dobes Blog Dog News How the Cinnamon Trust can help. How the Cinnamon Trust can help. 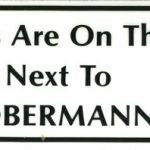 This letter was received from past Dobermann Rescue Chairman – Peter Kelly. When Charlie adopted me back in April 2010 he had 2-acres in which to run free and did not really need any other form of exercise, which was fortunate because I was beginning to have leg problems. Now that we have moved to a bungalow on the south coast, with a reasonably-sized garden (with lots of squirrels – cat next door) he must still need the freedom that he had once enjoyed. Shortly after we moved here a magazine popped through the letterbox: it was from the Cinnamon Trust. Some Lifeline readers may remember an article I wrote a few years ago describing their activities. In many respects it’s aims are similar to those of Dobermann Rescue. It provides temporary or permanent help to those owners who can no longer care for their pets. As a further service the charity provides volunteer walkers all of whom are very thoroughly vetted and covered by insurance. Consequently, Charlie is now enjoying regular walks on the nearby beach, often with me tottering along behind, or waiting in the car. So my heartfelt thanks to the Cinnamon Trust for their help – should anyone in the same situation as myself be reading this (or if you know of someone) I do recommend that they get in touch. The charities address is: 10 Market Square, Hayle, Cornwall, TR27 4HE . Tel: 01736 757900 the service is free, but with all charities they are always in need of funds so, obviously, a donation would be gratefully accepted! More about Charlie – he is a stealer of chocolate. On three occasions now I have left some lying about. Entirely my fault and it won’t happen again – very toxic, but this time no harm done. He also has a tendency not content with his own armchair, to sleep on my bed during the day. Again my fault! I keep forgetting to close the door. I hope it won’t happen again. A final thought: in early 2010 Charlie’s age was estimated to be 12 (vet’s opinion) judging by his antics I would say he is about 8 at the most and not 14-as he would be now, most Dobermanns now-a-days live beyond 10/11 years. I am keeping my fingers crossed that I am right!